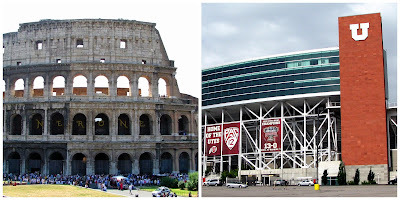 I dropped the Colosseum on the middle of the University of Utah campus and it's interesting to see how it compares to the modern sports arenas. There are two arenas on campus: Rice-Eccles Stadium, where the Utes' football team plays and where the 2002 Winter Olympic ceremonies took place, and the Jon M. Hunstman Center, where the Utes' basketball teams and women's gymnastics compete. 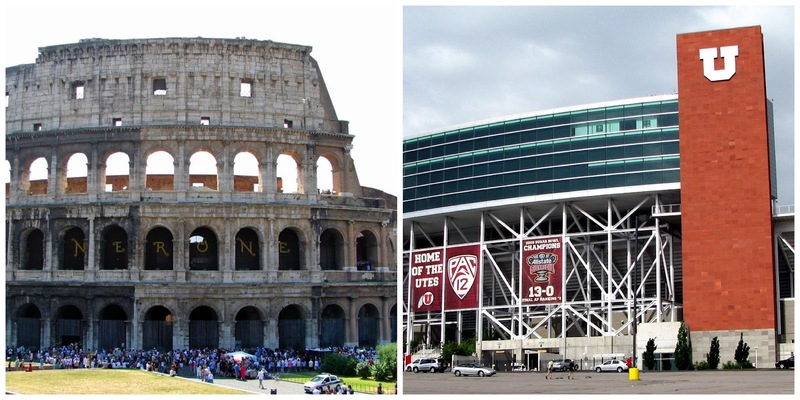 While it is roughly similar in size to Rice-Eccles Stadium, the Colosseum would probably have dwarfed Rice-Eccles in appearance due to the difference in building techniques. It is debatable which are the best seats at Rice-Eccles. There are the front line seats, closest to the action, or the "luxury suites" (953 seats) up in the skyboxes. There are generally better seats at Rice-Eccles than in the Colosseum, because it has 15,015 "chair seats," but the other ca. 30,000 seats in the bleachers aren't much better than what the Roman enjoyed! The Huntsman Center has better overall seating, everyone gets a "chair seat", but there are only 194 front row seats. Bomgardner, D.L. 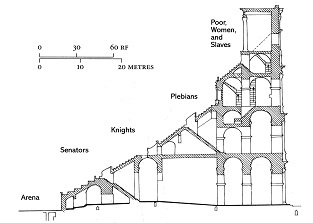 (2000) The Story of the Roman Amphitheater, p. 20. Richardson, L. (1992) A New Topographical Dictionary, p. 10.